Registered Aberdeen 25/05/1847. Master Hugh Sproat. One-and-a-half poop decks, three masts, female figurehead. Subscribing Owners: George Thompson, Jr., Shipowner, Aberdeen (40 shares); Hugh Sproat, Shipmaster (20). 25/03/1848: George Thompson Jr. 32 shares to Alexander Morice, Shipowner, Aberdeen. 24/04/1848: Morice 16 shares to Thompson. 27/10/1848: Morice 16 shares to Thompson in trust for behalf of Creditors of Morice. 07/05/1849: Thompson 16 shares to James Edmond, Advocate, Aberdeen as Trustee on sequestered Estate of Alexander Morice. 21/09/1849: Edmond 16 shares to Thompson. 18/02/1851: Thompson by Bill of Sale 13/05/1850 8 shares to Francis Hay Nichol, residing in Aberdeen. 01/03/1852: WIlliam Talbot endorsed Master at London in Room of Hugh Sproat. 21/01/1853: John Jameson endorsed Master at London in Room of Talbot. 1848: Owners Morice, port belonging to Aberdeen, Master H. Sproat, Destined voyage Aberdeen-Manilla. 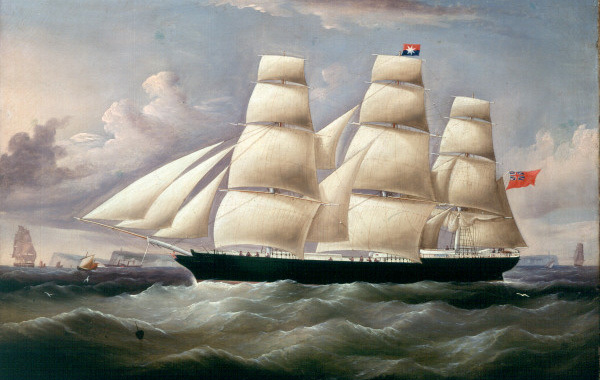 1849, 1850: Destined voyage Aberdeen-Manilla. 1851: Owners Thompson, Master H. Sproat, Destined voyage London-Sydney. 1853, 1857: Owners Thompson, Master Jameson. 1861, 1862, 1864-5: Owners Andrews & Co., Port belonging to Belfast, Master R. Savage, Destined Voyage Belfast-China. PHOENICIAN, barque, London to Sydney N.S.W., spoken 8 August, 52S, 34W [S. of Falkland Islands]. This fine vessel has just made the quickest passage from Sydney on record, bringing with her upwards of 80,000 (?) lbs of Australian gold. The Phoenician left the colony on 12th November and arrived off Plymouth on 3rd instant. Thus makng the passage in 83 days. Sailing and carrying powers were never more happily combined than in this vessel, which has discharged 780 tons of dead weight and has invariably made such passages as have not been surpassed either by British or American Ships. The Sydney Herald of 11th November in reference to the Phoenician says:- "This vessel will again leave this port tomorrow for London... She will probably arrive in England about the 20th February, thus accomplishing the passage out and home, including detention of loading and discharging, in the sport space of 8 months and a half... An Aberdeen correspondent of The Times expresses the hope that when the facts are duly considered it would no longer be contended that the American clippers have any just claim to be considered the fastest sailors or as worthy of a preference over British ships like the Phoenician and others of the same build". Sydney, 15/09/1854, list of gold dust and sovereigns exported: PHOENICIAN (barque) 4204 ounces, 5000 sovereigns. PHOENICIAN, barque, of Aberdeen, bound south on 1 January, spoken in Lat. 42°25' N, Long. 13°15 W [off Cape Finisterre]. Portsmouth 31 January - sailed barque PHOENICIAN for Sydney.